A year in the life. | Loch Lomond Livestock Ltd. This page is designed to give you an idea of how our cattle are produced, whether you are another curious producer or someone not so familiar with cattle farming. Hopefully it gives you a bit more of a picture of our farm. Our calves are born from late March to early June, with the majority being born in April. The cow are left out on a small pasture near the yard where we can keep a close eye on them and bring them into the corrals if we need to. We rarely have to do this, but occasionally we will get a calf born in cold weather that needs to be warmed up, or that needs help to get started for some reason. Having the cows spread out helps to limit the spread of any diseases and allows the cows space to bond with their calf. The first time calvers (2 year olds) are brought into a corral. We do this so that we can keep a closer eye on them, as they are more likely to need help having their calf. This also helps to get them used to us and quieted down even more in case we do need to give them some assistance. At about 1 day of age, we put 2 ear tags in each calf. One ear tag is a radio frequency tag which all cattle in Canada must have before they leave the farm they were born on and will always be linked to this animal. The other tag is an identification tag which has the calf’s name or number as well as the cow’s name and the bull’s initial. An example of tags we put in heifer calves. 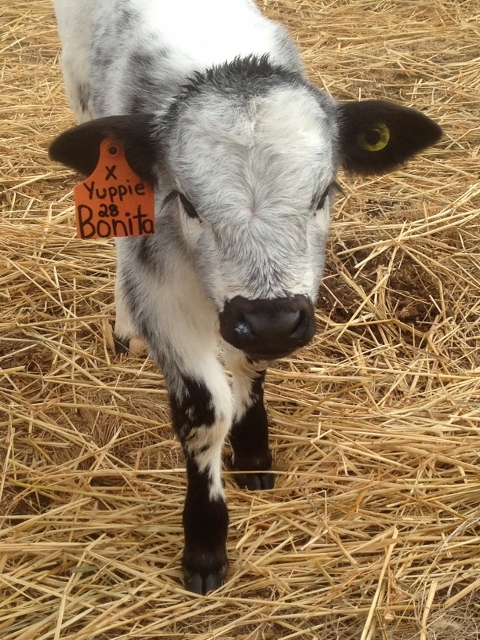 This calf’s name is Bonita. She is number 28, which matches with the yellow RFID tag in her other ear. Her mother is Yuppie and her father is X-rated, our Speckle Park bull. 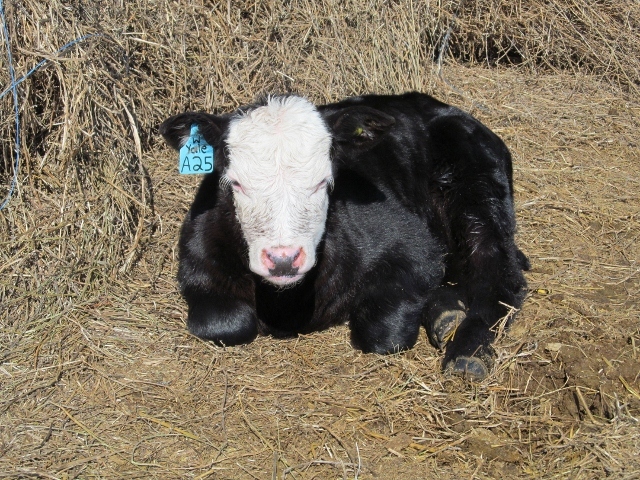 Example of an ear tag in a steer calf. He the 25th calf born in 2013 so he has ‘A25’ on his tag. His mother is Yale and father is Winston. Each letter of the alphabet is associated with a certain year, so all calves born that year will have the same letter, and this is the same across Canada. 2014 is the ‘B’ year, so all our heifers have names that start with B and the steers are B1, etc. We change the colour of the heifer calves tags each year as a quick identifier of how old they are. Heifer calves are given names, while steer calves (castrated males) are all given blue tags with their number and the letter for the year. At the same time as tagging, bulls are castrated using a rubber castrating ring. Castrating the bulls at this early stage means that they will heal quickly, and the pain is minimised. If bulls are not castrated, they will fight once they reach sexual maturity and can have meat quality issues. As soon as the weather is warm enough, we will start to move pairs that are doing well to a nearby pasture. We have found that moving a few pairs a day is much easier than trying to move a big bunch at this stage, as invariably some cows and calves get separated in a big bunch. When calves get separated from their mothers, their first instinct is to return to the place where they were last fed. The cow also has this instinct, so if a calf does end up returning back to the last pasture, the cow will come back to find it once she realises it hasn’t come with her. We continue to feed hay to the cows out on pasture until the grass has enough growth for the cows to get all they need from it. It is important to make sure that the cows don’t lose much body condition after calving so they will breed back in a reasonable time frame and calve and roughly the same time each year. In early June, we bring all the cows and calves back into the yard for vaccinating. We first separate the cows from calves so the calves don’t get injured while we are handling them. We use a sorting panel that John built after we saw a similar setup at the U of S farm. It allows the calves to slip underneath in one pen while the cows go out a gate next to the panel into another pen. Calves are given their first vaccines to protect them against common diseases like tetanus and pneumonia. Cows are vaccinated every second year to make sure they maintain their immunity as well. We use a chute system with a headgate to catch and hold each animal as we give it the vaccinations. It takes only a few seconds for each animal, and then they are released back with the herd. Many producers also brand calves at this time, but we stopped branding our cattle years ago. They are never mixed with other herds, and with two tags (and my ability to recognise them) we have found it unneccessary. After everything is vaccinated, we sort the cows and their calves into different breeding groups (what cows will be bred to what bull). Depending on when we do this, sometimes we will put the bulls with the cows at this time, other times we will deliver the bulls to the pasture at a later date – about June 25. After we have everyone sorted, we will move them back out to pasture in their new groups. This is normally a long day, starting at 7am and finishing about 9pm, so we are glad they don’t happen often! In the summer, the cattle don’t require much care, but we check routinely for any problems that might pop up. We rotationally graze pastures, leaving a group of cattle on a pasture anywhere from a week to a month. We use some electric fence and some barbed wire fence. Most of our pasture has access to a shallow waterline so that the cattle get fresh well water all summer. Dugouts and sloughs (wetlands) are fenced out to keep the cattle from contaminating the water and to provide wildlife habitat. When we move cattle we have to move the water troughs and any fencing equipement that we need as well (e.g. electric fencer, battery), which is a bit more work, but is worth it to have healthy cattle and healthy land. We have both tame grasses (e.g. Crested Wheatgrass, Bromegrass) and legumes (e.g. Alfalfa, Cicer Milkvetch) and native prairie grasses (e.g. Blue grama, native wheatgrasses). We prefer to graze the tame grasses earlier on in the season and leave the native prairie until July or later to better match the production of the grasses. As the summer progresses, we group the cattle back together as the breeding season comes to an end. Bulls are moved out of the pastures in late August so that calving is done by early June. We like to leave the cattle out on pasture as late as the grass will allow and often will graze early grazed pastures again at this time. We start to feed hay in late November usually, but leave the cows out until the weather, or location of their hay dictates they should be brought back to the yard. 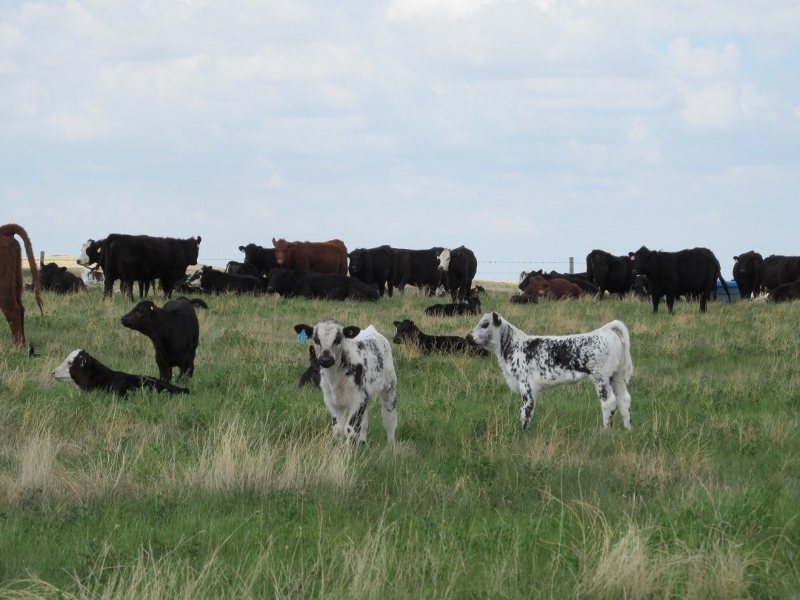 The calves born in the spring are weaned from their mothers in November. 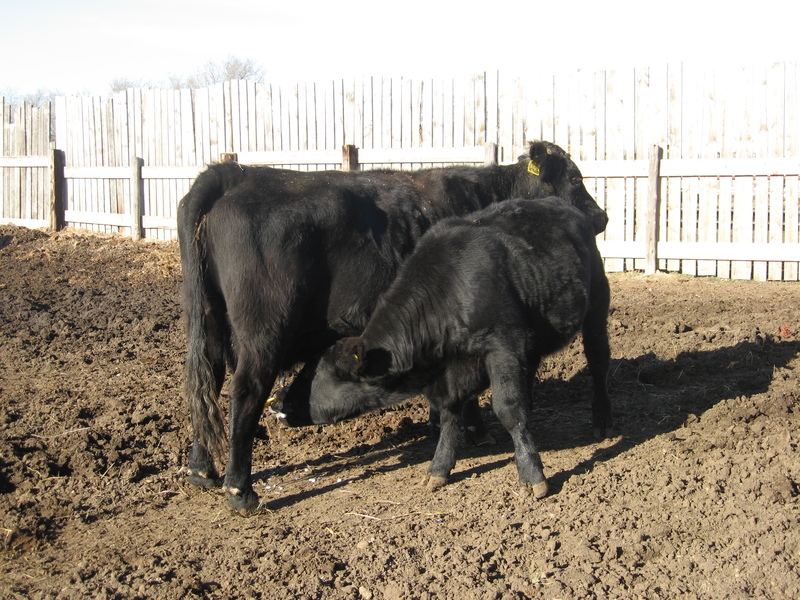 We do this using a two-stage weaning method developed at the University of Saskatchewan. First, we bring the cattle into the yard and separate the cows from the calves, like we do in the spring. Then we put the calves through the chute and give them their booster vaccinations. We also put a nose paddle into the calf’s nose and then let them back out with the cows. The nose paddle prevents the calf from sucking milk from the cow but allows the calf to stay with their mother as well as eat grass or hay and drink water. It is neat to see the calves try to suckle with the nose paddles in, they go back and forth and eventually give up and just hold their head in the sucking position. In the first few days after the nose paddles go in, the cows and their calves are usually very close to each other. After about 5-8 days, we bring them back in, sort the calves off again, remove the nose paddles and put them in a separate pen from the cows. This mimicks how weaning happens in nature – first the mother stops producing milk and then the offspring will eventually become independent. We have found that the calves seem to transition very well, but the cows still take a day or two to let go of their babies. Usually we will also get the veterinarian to come at this time and pregnancy check the cows. Anything that isn’t going to have a calf in the spring is marked and sold. After weaning, the cows go back out and the calves are kept near the yard and fed hay. Once we bring the cows back into the yard the calves are put in the corral for the winter to keep them somewhat sheltered and to allow them easier access to feed. Winter cattle chores consist mainly of feeding hay. The days are short and cold, so we don’t spend more time outside than necessary! It is a good time of year to catch up on other, indoor jobs. And soon enough, spring arrives again and calving starts all over again.